Over the past couple of months I’ve been putting together a new project, a brief handbook aimed at pre-tenure faculty members in the humanities and social sciences. It actually started as a blog post here, then expanded well out of control, and now here we are. Today, I’m pleased to announce the open-access publication of Talking about Impact: a handbook for pre-tenure humanists and social scientists, through the Wayne State University Digital Commons. My own work straddles several disciplinary realms, and it’s been fascinating, over the past decade, to speak to colleagues from disciplines as far afield as Semitic philology and cognitive neuroscience about what they value, and why. Being on the tenure track is extremely stressful, and nearly everyone feels anxiety about the process. When going up for tenure, your work will be read and evaluated by people who have no knowledge of your field, and often have very different ideas about how to evaluate scholarship. It’s worth taking some time to organize some knowledge about how and why your work matters, to leave as little as possible to chance. Talking about Impact is meant to serve that function for people across the humanities and social sciences, whether they’re tenured or not. I’m making the handbook available for everyone, freely, under a Creative Commons license, in the hope that it will be of broad use. I decided against traditional publication because it’s an article-length work, but hardly the sort of thing that a journal would publish, and in any case, any venue like that would have far too restricted an audience. Please feel free to download and distribute widely. 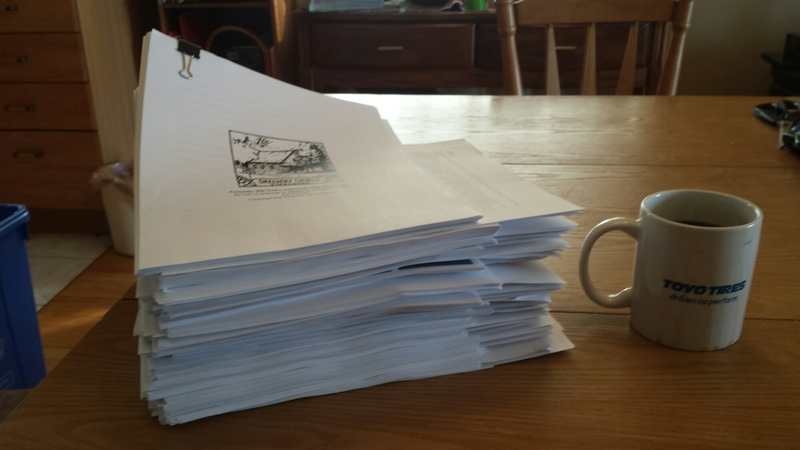 For those of you wondering where I’ve been, here’s the stack of grading I just received on Tuesday. It took me the better part of an hour just to get it sorted out the way I like it. Staples removed, paper clips removed, binder clips added, collated with all of the previous comments I’ve made on earlier drafts. I also have the students write up a list of edits that made just as bullet points. 29 papers, ranging in length from 21 to 77 pages. So classes are done, but this stack is probably a good 30 hours of work and these are papers I’ve already read once before. Coffee mug included for scale ( coffee included for sanity). I’ll be back in May. Anthropology has a long history of interactions with non-mainstream or pseudoscientific ideas. In our scholarship, classrooms, and public outreach, we are frequently confronted by advocates of ideas far beyond mainstream scientific understandings. Some of these ideas are directly challenged by anthropological data, such as ‘scientific’ racism, intelligent design, hyperdiffusionism, ancient aliens, 2012 millenarianism, pyramidology, and cryptozoology. Other pseudoscientific ideas are non-anthropological, but encountered in interaction with publics interested in medicine, the environment, or religion: homeopathy, climate change denial, biorhythms, dowsing, etc. What can – and what should – we do about them? What is our obligation to address (or not) these ‘strange’ sciences? And what tools does anthropology – as a ‘strange science’ itself, confronting challenges to its scientific status both from within and without – bring to bear that other disciplines lack? Archaeologists have long been interested in addressing their publics about the value of scientific reasoning and in particular in countering mythical and often pernicious ideas about the past (Feder 2014). Similarly, biological anthropologists have done much to address the myth of biological race and to confront creationist ideas (Marks 2012). But our encounters with fringe ideas are more numerous and more complex than these, and cross all the subfields. We are also faced with different sorts of challenges: when these ideas come from our students or consultants, how do we maintain respectful social relationships while still making knowledge claims? How do we justify our knowledge claims in an environment ever more given to epistemological skepticism about the authority of science? The goal of this panel is to address anthropological encounters with ‘strange science’ in the field, in the classroom, and in encounters with colleagues, from the perspective of scientifically-oriented anthropology across all subfields. Within a framework that posits that anthropology can, indeed, make verifiable truth-claims, abstracts are welcome that discuss any anthropological dialogue or engagement with non-mainstream scientific ideas, past or present, including but not limited to those mentioned above. Please respond to this call by April 3, 2015 by emailing an abstract of no more than 250 words to Stephen Chrisomalis (Wayne State University) at chrisomalis [at] wayne.edu. A discussant slot would also be extremely welcome. Please feel free to distribute to any colleagues or students who may be interested. As with any AAA panel, all panelists must be registered AAA members and additionally register for the conference. Today is National Adjunct Walkout Day, and if National Anthropology Day (from my last post) is not going to become a statutory holiday, you can be doubly sure that this one won’t either. It has come about in order to raise awareness of and provoke action against a serious problem: the working conditions of adjunct faculty in academia. Along with organizations like the New Faculty Majority, the aim of NAWD is to highlight the low pay, lack of benefits, and insecure employment of most of the people who teach college students today. I, along with a significant but declining number of faculty, am tenured, having recently completed my probationary six-year period as a tenure-track assistant professor. We (the tenure-track and tenured) currently constitute about 30% of all faculty, and probably are what you think of when you think of a college professor. The other 70% consist of a range of contingent or contractual faculty whose working conditions and pay vary enormously, but at the low end – the faculty labelled ‘adjunct instructor’ or ‘part-time faculty’ or ‘sessional lecturer’, who teach courses on a per-term, no-benefits basis – those conditions are frequently deeply exploitative. This ratio of tenure-stream to others is not an inevitable or eternal state of affairs, however: forty years ago it was basically reversed. The present situation has arisen out of a variety of circumstances, including but not limited to decline in governmental funding for higher education, increased labor supply (production of PhD graduates), and changing expectations of the role of universities. As a tenured faculty member at a public research institution, I’m extremely lucky and privileged. I’m not nearly so naive as to suppose that my current conditions of employment were an inevitable product of my superior merit for the job I occupy. I also believe that we (the tenured few) have a positive obligation to think and talk about the aspects of our profession that, by virtue of our protected status, we can safely address. Between 2001 and 2008 I held a variety of positions as an instructor, none of which were tenure-stream: graduate student instructor, adjunct instructor, postdoctoral fellow, and visiting professor. I was never unemployed but also never secure. I haven’t forgotten – nor, as I am reminded every time I look at my disciplinary job listings virtually out of habit, have I fully recovered. In the weeks to come, I have a couple of posts floating around in my head that talk about some of the issues that I think serve as obstacles to progress in this discourse, some of which I’ve been talking about privately with colleagues for years, others of which are incompletely formed. But today I have just one real thought to impart. You may think that it doesn’t much matter whether the person teaching your kids freshman composition is on food stamps, that it doesn’t matter whether your spouse’s chemistry instructor has health benefits, or whether your own favorite anthropology professor works at four different colleges to make ends meet. You’d be wrong, but I get that you might think that, because to be honest, most of the adjuncts I’ve worked with as colleagues – and most of the instructors I’ve been in the past – are good at their job, and they don’t sit around bemoaning their lives. That they do their jobs well, paradoxically, renders them more invisible than would otherwise be the case. That is exactly the problem that National Adjunct Walkout Day is meant to remedy. As part of NAWD, some adjuncts (and others) will engage in job action including but not limited to public protests, cancelling classes, or other forms of direct action, even though they know their employment is at risk. But here’s the thing: their employment was already at risk, just by virtue of their status. So if you happen to be on a college campus today, or if you see the hashtag #NAWD on Twitter, bear in mind that the ivory tower is built from a foundation of the labor of many whose absence would rapidly bring about its collapse. Today, Feb. 19, is National Anthropology Day. Now, you may not have previously heard of this hallowed waypoint in the seasonal cycle, and the likelihood that you’ll see Hallmark picking up on this is close to zero, but nevertheless, here it is. 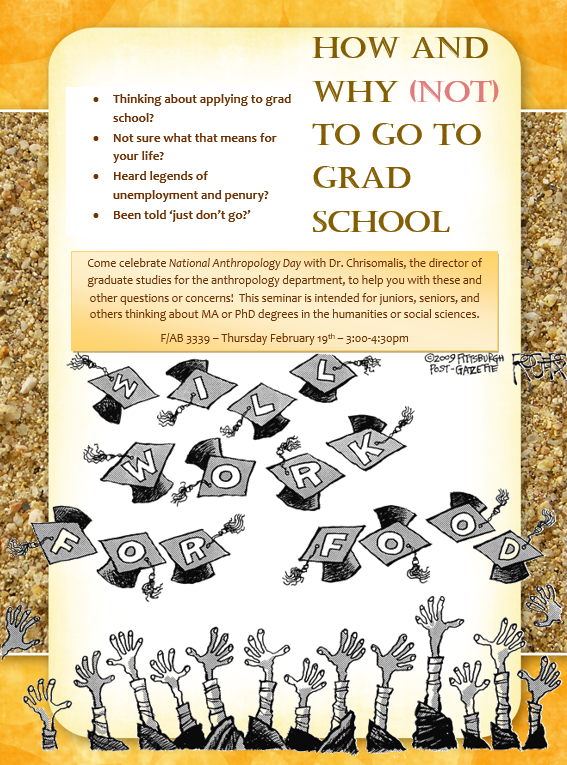 In honor of this most glorious occasion, I will be presenting a talk I’ve given many times before, in various forms, entitled ‘How and why (not) to go to grad school’, in this case, at a seminar sponsored by the Wayne State Anthropology Learning Community. (By the way, in case you were wondering, learning communities, when well done, are more or less the best. And ours is the best.) Stop by if you’re around. I posted about this topic more than five years ago, when Glossographia was just a baby-blog, in ‘To grad or not to grad‘. In reading over the old post, I still agree wholeheartedly with the general point. To simply offer a blanket ‘just don’t go to grad school’, which many faculty do, is wrongheaded. It’s insulting, and will likely convince the wrong students to avoid grad training, while failing to sway many who shouldn’t apply. In place of unambiguous injunctions, we need fact-sharing and clear thinking. We should indeed be interrogating our students as to why they want to go to grad school. We ought to be ensuring that they are aware of (and have clear paths laid for) other career options. And we certainly shouldn’t be encouraging otherwise ambivalent students to pursue this path. But advice, not platitudes, is called for. – I wasn’t clear enough that an unfunded MA may indeed make sense, if it’s the only graduate degree you want, and if you are pursuing it for clear professional reasons that do not include the PhD. My original post may read as assuming that if you are doing an MA, it is because you are eventually planning to do a PhD. But the vast majority of MA students in anthropology never apply to doctoral programs, and they end up (largely) professionally successful. Funding is still great, where available, but a targeted two-year masters without funding will likely be worth it in the long run, if you know what you want out of the degree. – I didn’t emphasize as clearly as I should have the importance of planning, as much as two to three years before you apply to graduate school, to become the sort of applicant whose chances of success are greatest. You can have a fancy GPA in the upper 3s, but if you don’t have a record of undergraduate research and multiple full-time faculty to support your application, you’re shooting yourself in the foot. Identifying faculty to work with/study under, and projects to undertake, means that you can’t just decide six months before that you’re ready to apply, no matter how bright you (think you) are. – Like many social scientists and humanists, I probably have some ‘science envy’, and put too much emphasis on the bad market in these fields. In fact, I probably underemphasized (or was unaware of) just how bad things are in the natural sciences as well. The programs are larger, there’s the expectation of one or more postdocs before a tenure-track job, and it’s just as terrifying. Honestly maybe moreso: I do not look at my colleagues on the tenure track in the sciences with envy. – I really didn’t talk enough (or at all) about the role of class and gender in ‘just don’t go’ advice. I am concerned that female students, given the pressures of impostor syndrome and stereotype threat, are more likely to take ‘just don’t go’ to heart, where less or equally capable male students may press on. That doesn’t help anyone. The role of class, too, in dissuading working-class students from pursuing graduate work, seems to me deleterious to the profession. Grad school is economically risky, but so too is post-degree unemployment, and I guarantee you that scarce post-BA internships and professional jobs get snapped up with people with social networks and cultural capital to back them up. For academically-strong students whose family and community ties offer no meaningful employment support for someone with a BA, graduate school may be the least risky option. Wayne State folks, hope to see you there. Happy National Anthropology Day! P.S. Finally, and this is just a minor complaint, but I object strenuously that no one seems to have noticed or commented on the fact that I used the verb ‘decimate’ in its etymologically-correct but practically-useless sense in my original post, to refer to the reduction of something by 1/10 (in this case, endowments). Hmph! Do you know how hard you have to work to find a context where you can use ‘decimate’ to mean what pedants think it always ought to mean? What fun is it being an anti-pedant when pedants don’t even notice your playful anti-pedantry? Over five years ago, I published what was (for a long time) to be my most popular post here at Glossographia, A feisty embuggerance, in which I described in the wild a particularly bizarre sort of optical character recognition error that found its way into Google Scholar’s metadata, resulting in an otherwise ordinary paper authored by the unlikely duo of Escalate Embuggerance and Holistic Feisty (Embuggerance and Feisty 1985). After the folks at Language Log talked about it, I thought for sure that it would be scant weeks before the error was corrected. Alas, here we are, in 2015, and Mother Google can share my search history with any advertiser it chooses, following me around with ads for products I’ve already bought, but can’t fix a basic and obvious error even after I did all the work of pointing it out to them. Embuggerance, Escalate, and Holistic Feisty. “The linguistics of laughter.” English Today 47 (1985). It’s probably not a secret to anyone who has ever been in grad school (or who reads PHD Comics) that departmental and college social events can be an important way to stave off starvation. My own graduate studies in anthropology at McGill were characterized, in my dim recollection, by half-full plates of cheese and bread stuffed not-so-surreptitiously into backpacks and carted away by those fortunate souls whose hard-earned anthropological knowledge of generalized reciprocity or optimal foraging theory translated into practice. Oh, right, and the wine. So much department wine. Less of that here at Wayne State, alas. Chalk that up to American social mores, I guess. – ‘Brownbags’ – Contrary to the name, many of these have plentiful free food provided, often of the donuts-and-coffee variety, but sometimes ranging up to a full-on lunch. Find out which of these have complimentary snacks on hand and take full advantage. – Lounge Scrounging – Departmental lounges and common areas are an excellent source of leftovers from events you couldn’t make it to, classes with generous professors, or any of the other items on this list. This is a qualitative leap forward from dumpster diving – bon appetit! – Bait – There are all sorts of events where food is essentially the cheese in the mousetrap of work. Writing workshops, assessment workshops, anything where mid-level administrators want to bribe faculty to do something they might not otherwise do. Many or most of these are also open to grad students, so even if you think you know all about learning outcomes, bear in mind that a full belly is also a great outcome. – All Saints’ Bonanza – If you thought that Hallowe’en parties were fun, just wait until Nov. 1 when faculty bring their leftovers to campus. Also of some benefit on The Feast of Romantic Rejection (Feb. 15) and Really, Really Fat Monday (which is a statutory holiday among my people). – Pot Luck – Dirty little secret: someone may notice or care if I (a tenured faculty member) bring a tray of crackers poured out of a box in exchange for a bounty of delicious meats, but nobody cares if budget-constrained grad students do the same. Buy low, eat hearty, I say. – Eating ‘Up’ – As it turns out, the higher you go in the pecking order, the better the food gets. And sometimes events for or by bigwig administrators are free to the public, because deanlets and assistants-to-the-executive-vice-president-for-hyphenation like to see people come to things, and demonstrate, potlatch-style, their magnanimous ability to fill people with hors d’oeuvres. So the next time a new building is opening or a provost is being welcomed to campus, take note. But beyond gorging yourself at the trough of academia, it’s worth thinking about why you should want to be there, beyond the food. Eating, after all, is a social activity. And although we’re not taking attendance, faculty definitely do notice who’s around at events, who takes the opportunity to stop by even for half an hour, to (appear to) pay attention at a talk that just happens to have a side-table feast. As it turns out, we (faculty) also like free food, and some of us (OK, not all of us) actually like hanging out with one another from time to time. And we also pay attention to students who (appear to) share our predilections. I’m not saying that you forget about the opportunities to sate yourself on someone else’s dime, but also remember the social capital that will attach to your foodiness. I promise we won’t care if you take home a ‘graddie bag’.